Khichdi or khichri needs no introduction in India. It is cooked in most households in the country. Prepared using rice and lentils, it is often the first solid food fed to babies. Khichdi is also a comfort food for many of us owing to the convenience of being able to cook the dish in a single simmering pot. There are many variations of khichdi and it becomes a wholesome food and a complete meal by itself when paired with fresh vegetables and spices. 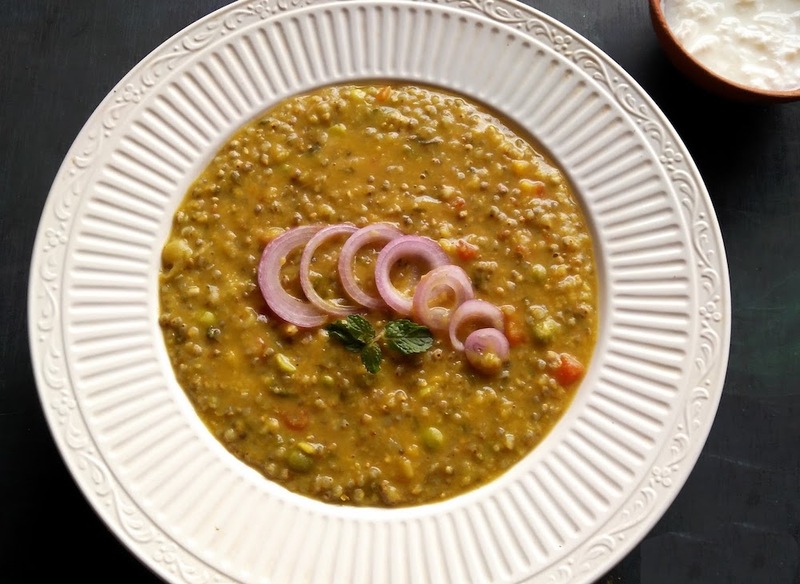 Bajra or khichdi is popular in the Indian states of Haryana and Rajasthan. A wholesome yet light meal, this khichdi is creamy, delicious and a great source of energy, protein, iron and folic acid which makes it a perfect food for pregnant women too. This khichdi is mildly spiced and utterly satisfying - the ideal companion on a chilly winter night. Wash and soak the bajra in enough water for 6-8 hours or overnight. Drain and rinse it in a colander and keep aside. Rinse the dal. Heat a pressure cooker and add ghee to it. Add cumin seeds. Once the seeds crackle, add green peas followed by carrot, asafoetida and turmeric powder. Now add the moong dal and pearl millet and stir fry for 1-2 minutes. Stir in the spice powders (red chilli powder and garam masala, if using) and mix well. Pour in 4-5 cups of water depending on how you'd like the consistency of your khichdi. Garnish it with coriander leaves. Lastly, sprinkle salt to taste, give it a quick stir and put the lid on the cooker. Pressure cook the khichdi for 3-4 whistles and then simmer for 10 minutes. Turn off the flame. Open the lid of the pressure pan, once all the steam has released. The delicious khichdi is ready to serve along with raita or plain curd and salad. I have used black millet and moong dal in 1:1 proportion, you may use 1/2 cup of dal: 1 cup of bajra if you'd like the taste of bajra to be prominent. Adding vegetables is purely optional. The khichri thickens further as it cools down. A version of this recipe originally appeared here. Poonam is a microbiologist and blogger. On her blog, Annapurna, she shares a variety of recipes for nutritious, home cooked meals.